Whatever you're into - be it handicrafts, sewing or jewellery making - every artist needs a dedicated work space. 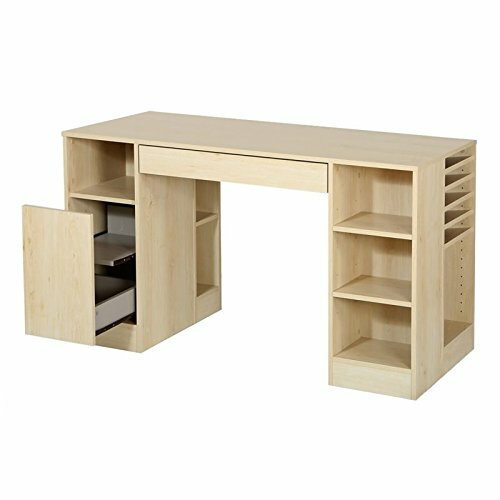 This worktable from the collection means you can set up your own creative space, so you'll no longer need to use the kitchen table and put everything away when you're done. With its neutral finish and simple lines, this table goes well in any room. So you can spend more time being creative and less time organizing your space and putting things away. Features: Ideal for keeping all creative materials. Large work surface, ideal for sewing, handicrafts or making jewellery. ; Easy-to-access storage spaces - some open, some closed - for a neat, orderly work space. ; Storage drawer under the work surface is divided for tidy storage of pens, pencils, calculators and other small items. ; Storage space on either side designed as interchangeable modules. ; 3 open storage spaces, defined by 2 shelves. ; 5 angled open storage spaces with adjustable shelves designed especially for holding 12'' x 12'' paper. ; Open storage space defined by a fixed shelf and a drawer: tall front panel covers shelf that slides out for easy ; 2 narrow storage spaces separated by a fixed shelf, ideal for putting away binders and magazines. ; The narrow storage spaces can be accessed from either side, so this table can be placed in a corner. ; All surfaces are laminated, so you can also place this worktable in the centre of a room so every side is visible. . Specifications: Accessories not included ; Clean with a dry damp cloth. ; The box for this item is heavy, so be sure to have a friend with you - or good biceps! - when it arrives. ; Overall Product Dimension: 30"H 53.5"W 23.5"D ; Weight: 121lb. Ideal for keeping all creative materials. Large work surface, ideal for sewing, handicrafts or making jewellery. Easy-to-access storage spaces - some open, some closed - for a neat, orderly work space. Storage drawer under the work surface is divided for tidy storage of pens, pencils, calculators and other small items. Storage space on either side designed as interchangeable modules. 3 open storage spaces, defined by 2 shelves.